Propidium Iodide (PI) binds to double-stranded DNA. PI cannot cross intact plasma membrane and therefore will only be present in DNA of cells where the plasma membrane has been compromised/ permeabilized. For Microscopy analysis: PI can be viewed using rhodamine(red) filter (?= 536/617). Cells will only be stained if the membrane has been permeated, either naturally (non-viable cells) or with detergents (for fluorescent staining). Flow Cytometry analysis: PI staining can be monitored in FL2 (DNA content) or FL3 (viability) channel. 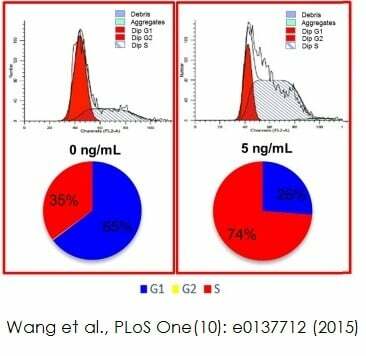 If used together as control for Annexin V assays ab14082, ab14083 or ab14152, PI should be diluted to 250 µg/ml solution (in PBS) prior use and added as 1 µl/ Annexin V Assay (0.25µg/assay). Propidium Iodide (PI) (MW=668.4 Da) is an intercalating agent and a fluorescent molecule which is membrane impermeant and generally excluded from viable cells. Upon entering cells, PI will bind to DNA and RNA by intercalating between bases. Once bound to the nucleic acids, its fluorescence is enhanced 20- to 30-fold. Exmax= 536nm / Emmax= 617 nm. Our Abpromise guarantee covers the use of ab14083 in the following tested applications. Wang et al. used ab14083 to investigate an optimized platform for maintaining proliferation of giant panda mesenchymal stem cells (MSCs). MSCs were fixed in 70% alcohol and 30% PBS at 4°C for 1 hour. Cells are then incubated in the dark with PBS, 20µg/ml propidium iodide (ab14083) and 1% RNaseA for 30 minutes at 37°C. Cell samples are resuspended in PBS and analyzed using FACS Calibur flow cytometry. Flow cytometry analysis shows the cells are at different cell cycle stages in different concentrations (0ng/ml and 5ng/ml respectively) of basic fibroblast growth factor (bFGF). Immunofluorescence analysis using ab14083Image from Melia MM et al ., Plos One.,29 (8). Fig 1b DOI: 10.1371/journal.pone.0106281. 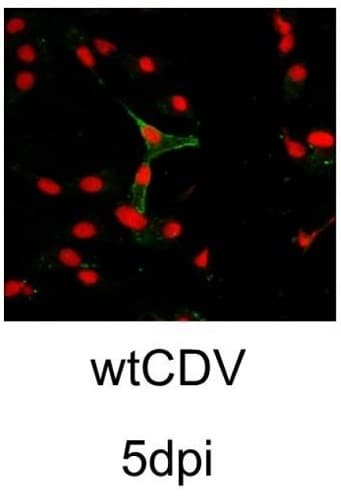 Vero-DogSLAM (VDS) cells and Vero (African Green Monkey kidney) cells were infected with wtCDV. Cells were fixed, permeabilised and stained with SSPE serum and rabbit anti-human FITC; nuclei were stained using ab14083 propidium iodide. Images were taken using a Nikon Eclipse TE2000-U UV microscope (x400). Publishing research using ab14083? Please let us know so that we can cite the reference in this datasheet. It suggests using a solution of 50ug/mL, so dilute the amount of the 1mg/mL stock that you anticipate needing 1/20 to get it to 50ug/mL. PBS is fine for the diluent. Many thanks for your reply, excellent news. Do you have a suggested protocol that i could have and can it be used in conjunction with Annexin V to detect apoptosis? Sorry to ask a lot of questions. Both Annexin V-EGFP Apoptosis Detection Reagents (ab14152 and ab14082) contain a protocol booklet in their datasheets. These are the recommended protocols to use along with the Propidium Iodide reagent. If you had any doubt or suggestions regarding the protocols or any other products, please do not hesitate to contact us back. We are more than happy to help. rormalin fixed paraffin embedded tissues. Will this be suitable for us? I confirm the product Propiduim Iodide ab14083 can definitely be used with paraffin-embedded, formalin-fixed tissues. Thank you for your comprehension, and please do not hesitate to contact us back for further assistance. I am enquiring about your Propidium Iodide (ab14083). Is this product suitable for using on fixed tissue samples? I would like to identifiy necrosis by fluorescence microscopy in my wound tissue samples (mouse). Yes, Propidium Iodide ab14083 can definitely be used with fixed tissue samples. habe den Assay ohne Ribonuclease gemacht, sehe keine individuellen peaks, nur einen. Wie wichtig ist dieser Schritt? Wie versprochen habe ich mich nach den aktuellen Details des Propidiumiodid-Staining Protokolls erkundigt – an diesem seit Jahren bewährten Protokoll hat sich nichts geändert. Ein Mitarbeiter von Derek Davies hat bestätigt, dass der Verdau mit RNase essentiell ist, um zu gewährleisten, dass nur DNA angefärbt wird. Der RNA-Gehalt von Zellen variiert immer sehr stark; unter Umstaenden kann das RNA-Signal dann so stark sein, dass das DNA-Signal überlagert wird. Für akkurate Ergebnisse ist dieser Schritt also unabdingbar. Wenn Sie aus experimentellen oder anderen Gründen keinen RNA-Verdau durchführen möchten, müssten Sie auf einen Farbstoff zurückgreifen, der (hinreichend) DNA-spezifisch ist, wie zum Beispiel DRAQ5 (ab108410) oder DAPI. Für diese benötigen Sie allerdings aufgrund der spektralen Eigenschaften (Ex 646 nm/Em 681 nm /697 nm intercalated with dsDNA bzw. Ex 358nm/Em 461 nm) entsprechende (UV-)Laser und Filter. PI weist bei 605 nm ein Emissionsmaximum auf, so dass es auf einem Calibur entweder in FL2 (585/42BP Filter) oder FL3 (650LP Filter) gemessen werden kann. Auf LSR-Cytometern kann PI mit dem 610/10 Filter, dem 575/20 Blue-Filter oder dem 640/20 Yellow-Filter gemessen werden. Für die meisten Säugerzellen liegen typische Spannungen für PI um 400 V (Calibur) beziehungsweise 300 V (LSR). Wenn Sie keine individuellen Peaks für die einzelnen Zellzyklusphasen detektieren, kann dies auch ein Hinweis darauf sein, dass die Konzentration von PI zu hoch ist. In diesem Fall kann eine Titration helfen, die optimale Konzentration für Ihre experimentellen Gegebenheiten zu ermitteln. Ich hoffe, diese Informationen helfen Ihnen weiter und wünsche Ihnen viel Erfolg für Ihr Projekt. Bitte zögern Sie nicht, sich wieder bei uns zu melden, falls Sie weitere Fragen haben. Thank you for sending your data, it was very helpful in this case. Since the first peak is much higher, I suspect it should be a combination of sub G1 and cell debris. Usually if it is cell debris, it should just be at the bottom and there shouldn’t be a peak. But in this case probably the presence of increased sub G1 cells or a possible contamination could yield such a result. Please let me know if there is anything else I can help you with. Will this dye measure the subG0 phase? Thank you for calling Abcam earlier. I am going to email the lab about your query and I just wanted to make sure I had written it down correctly, were you asking: "Will Propidium Iodide label the sub G0 phase" Is that correct? If so, I will go ahead and forward you question to the lab. I look forward to your reply. I am seeing alot of staining in the zebrafish yolk. Why? Thank you for your enquiry and your patience. I do not have any specific advice on why you see staining in the yolk. The best resource is probably the protocols you can find in the zebrafish book at www.zfin.org I believe that methanol washes may be a way to remove the staining in the yolk, but another zebrafish expert may have more information than me. I did not find any specific information addressing this problem in my old protocols. I hope this information helps, please do not hesitate to contact us if you need any more advice or information.